More than 130 scholars, officials and correspondents from over 30 countries and regions have gathered in Lhasa, capital of Tibet Autonomous Region in southwest China, for a Forum on the Development of Tibet. The scholars were very impressed by the changes Tibet had gone through in the past couple of years. Traveling in a convoy of buses, the scholars, who are interested in Tibetan culture, were carried from one place to another, to see the development of the holy land. With an average elevation of more than 3,600-metres, altitude sickness didn't seem to dampen the interests of the foreign scholars. Albert Ettinger, a German scholar, was very impressed by what he saw. "For those who often read newspapers from western countries, they would definitely be shocked by what they see here. I've read some books in French and German--I think the authors are all the mouthpieces of Dalai Lama. The books say Tibetans are like living in prisons. They ignore the economic development of Tibet, but whoever comes here would notice that the transportation system in Lhasa is quite developed, and the city planning is also very good." Likewise, Professor Bonaventure Haruna with the University of Jos in Nigeria was happy to see the development in Tibet, such as new infrastructure and all sorts of facilities. "I have never been here when Tibet was in its original state. I would prefer that Tibet should grow modern because everybody likes comfort. So why should people remain deprived of facilities that would make life comfortable. So let them ride on and provide them with facilities that would make life comfortable for the people." In addition, the professor said education, in particular, should be given priority as it has multiplier effect on impacting on all sectors and guaranteeing self-reliant development as envisaged by the Tibetan regional government. Against the background of China's "One Belt, One Road" Initiative, David Monyae, co-director of the University of Johannesburg Confucius Institute based in South Africa, said that the success of the initiative largely depends on how China manages its underdeveloped western regions such as Tibet. Also, he said it is universal that there will be a conflict between economic development and cultural preservation, but China is doing well. "This is not just a Chinese or Tibetan story. It's a global story. What do we do when we modernise. How do we modernise while we keep the tradition of our culture. It's a question of balancing--while you are modernising, you don't have to destroy your tradition and your culture. This is only the early phases, and the Chinese government is doing extremely well. China is learning from the world and the world is learning from China." The agenda of the forum will be focused on discussions of entrepreneurship and industrial modernization in Tibet, preserving tradition, environmental protection, Tibet's involvement in regional infrastructure projects and poverty relief. The conference will start later today and last until Saturday. 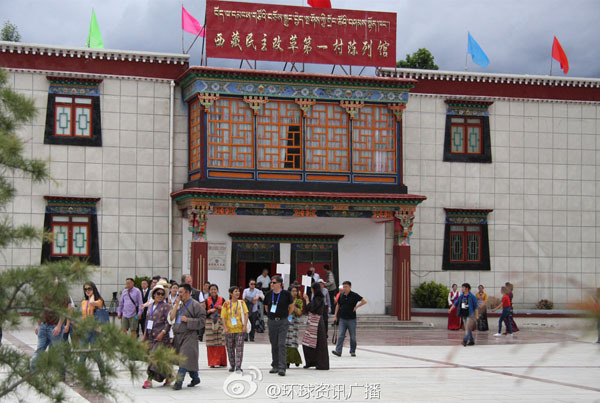 More than 130 scholars, officials and correspondents from over 30 countries and regions have gathered in Lhasa for a Forum on the Development of Tibet.